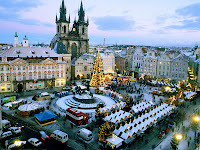 With antic architectures and preserved sites the Old Towne Square also offers us everything from the 21st century. We fall for the astonomical clocks which is unique in the entire world. And the tower at the square give us one of the most beautiful view in Europe. Here is a link for a panoramic view.